Victorius have been in touch for some time, after we first encountered them at the Glasgow M2tM final last year. At the time I thought they were verging into a thrashy kind of sound, but now I have a recorded piece of work to check out more thoroughly, it seems they’re more towards “heavy metal”, with some definite NWOBHM trappings. Thankfully, this is rectified by the time you get to “Silver Bullet” which has a more balanced, bass-friendly tone. A nice, driving rhythm and multiple vocalists brings forth a track that just gallops through its five minute length. 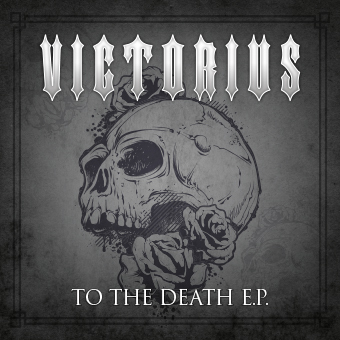 “Prepare To Rock” throws forth the first real feeling that Iron Maiden are quite the influence on Victorius, with the lead guitars carrying a similar tone – but that’s hardly a criticism as they’re very well done. If you’re going to sound like someone, sound like the best! Drum fills are great, too, leading into a nice instrumental break and singalong section at the halfway point. The title track is blistering, and the kind of thing I remember from the Ivory Blacks gig. This early metal; raw, thrashy, and punk-influenced and deserves to have the EP named after it. I’d actually say it’s got a touch of the Kill ’em All‘s about it. Again, I mean this as a compliment. This one’s designed to get the hair flying on those of you who still have hair! Closer “Rise From The Flames”, though… ooft. A second shy of nine minutes, it never seems that length when I listen to it. Chugging bass and thumped drums keep the rhythm going and the lyrics/vocals are the best of any of the songs. The guitars as well… the solos, the rhythms, everything. This is by far the best song on the EP and eclipses even the best of the others. Looking back on the album, it genuinely seems that the songs get better from one track to the next, ending with a blistering and lengthy instrumental section that definitely owes a lot to Murray, Harris, Smith, Gers and McBain. While the production, as mentioned, isn’t great, the songs are. Grab this collection for only £3 from the band themselves and use it to learn the songs before you go and see them live at Glasgow Audio on September 1st. The gig is free and features Victorius, The Colony, From Tyranny and headliners Nocturne Wulf. Admission, just to be clear, is zero pounds and zero pence. So go, enjoy, and buy merch!